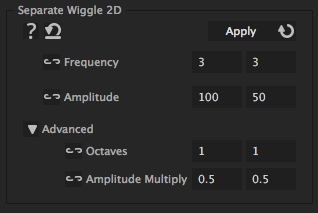 This wiggle expression allows to set the parameters of the wiggle in both dimensions separately. Having separate parameters for X and Y dimension allows you, for example, to wiggle twice as fast or twice as much up and down (Y) than left to right (X). You can use this also to wiggle only in X or only in Y direction: Just set the amplitude X to 0 to make it wiggle only in Y direction. If you want to wiggle only in one direction, you should also take a look at the Directional Wiggle iExpression.